WHAT WENT WRONG? : A lot of stuff. Give me a break. It was my first night doing 'the wire.' That is, taking photos and stories from world and national news outlets, mainly AP, but we run politics from The Post, hard news from The N.Y. Times, national and entertainment from The L.A. Times, Scripps Howard, and other wire stories. 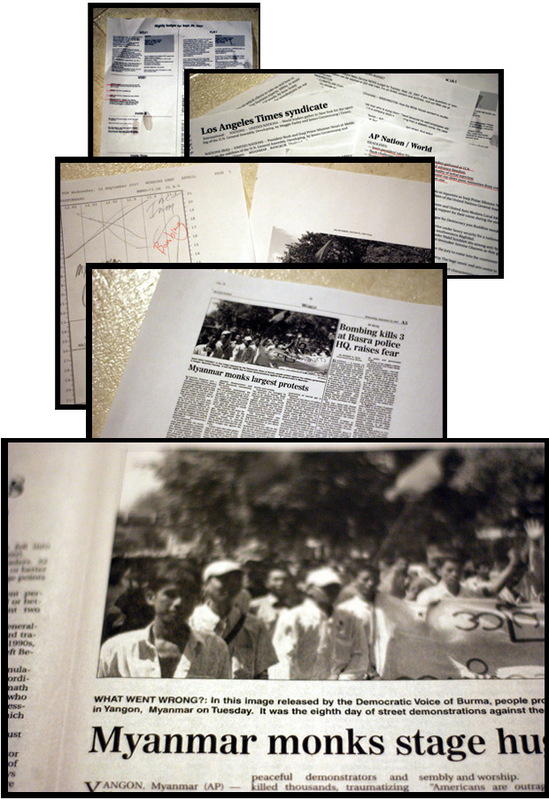 There is a lot involved in putting a page of the newspaper together. That's why I made some mistakes. I like Whistler's legal defense when he was taken to court for not putting enough time into a commissioned piece of art. When the judge asked him how long it had taken him to complete the painting, he replied something like, "My entire life." Meaning that all of the experiences he ever had, all of the painting, laboring, eating, washing, listening, talking, learning, loving- manifests itself in his work. I like to use that explanation for everything I do. "That sure was a good peanut butter & jelly sandwich, wasn't it?" So for the past month or so I have been almost-only proofing, that is looking over other copy editors' pages for mistakes in style, design, whatever, just mistakes. You get to learn better how a page is suppose to look proofing. I actually got the idea to start doing lead-ins on my blog from the photo caption lead-ins we do in the paper. But I forgot to do lead-ins to a couple photos tonight. A couple more nights and I'll be a lot better. It's a repetitive thing. An old lesson; practice makes perfect. It's how humans learn. Very simple. It is in academics, mechanics, art. Chan Chao, a documentary photographer and professor at the The George Washington University and the New York School of Visual Arts, used repetition in his 1991(?) portrait book of Burmese rebels, Burma: Something Went Wrong? Today, history is repeating itself. Repetition: civil unrest. Until we learn to get along with one another, there will be. Again, today, in Myanmar, formerly known as Burma, there is unrest. We kill each other. That's no way to act. Spread the 'good word;' we should learn to live together. You would think after all of those generations, all that over and over, we would learn. Say it. Don't Spray It -out of the end of an AK-47!